This week I got an interesting group of numbers and had to spend quite a bit of time debating where I was going to go with my first two numbers of the day. I know there will be complaints about my #29 pick but it’s important to remember that some athletes had more than one jersey number and while they did not get in at one number, they may still make it in another. Without further ado, the greatest athletes to ever wear 11, 29, 60, & 79. While I did spend some time thinking about #11 my thoughts always came back to Mark Messier – one of the greatest hockey players of all time. Mark Messier was a 6x NHL Champion and a 15x All-Star. Over the course of his 26 year long career that started in the now-defunct WHA Messier scored 1,887 points (2nd most all-time behind Wayne Gretzky) and played 1,756 regular season games (2nd most all-time behind Gordie Howe). Messier is the only person in North American sports to have captained two separate teams to a championship in their respective sport (Oilers and Rangers). Not just one of the greatest hockey players of all time, many consider Messier among the best leaders (in any sport) of all-time for what he brought to the ice and his team. He was the type of player that made everyone around him better and it was obvious that he should get Table #11. #29 was a toughie because there were so many ways I could’ve gone with this. I could’ve chosen one of the greatest goalies of all time, two of the best pitchers to ever throw in the major leagues, or one of the greatest running backs ever. Instead I chose a player who is one of the all-time great second basemen, a member of the 3,000 hit club and possibly the greatest player in the history of two different Major League franchises. I know that there will be a lot of debate with this choice (do yourself kindly to remember there are some athletes eligible for multiple jersey numbers) but in my mind Table #29 belongs to Rod Carew. One of the biggest factors that leads to Rod Carew’s astounding career is his longevity and how long he played at a high level. His careers with the Twins and Angels were both so impressive that his #29 has been retired by both ball clubs. Carew burst on to the scene in 1967 wrapping up the Rookie of the Year award and 10 years later he was the AL MVP. Between his two different teams, he appeared in a staggering 18 MLB All-Star games. One of my favorite Rod Carew statistics is that in 1972 he batted .318 which was good enough to win him the batting title. Oddly enough, that was the only year of his career where he did not have a home run. To this day, Carew is the only player to win a batting title without having hit a homerun. Carew finished his career with over 3,000 hits, over 1,000 RBIs, and a .328 batting average and was only the 22nd player to be elected into the MLB Hall of Fame on the first ballot. He holds both the Twins’ and Angels’ records for on-base percentage, holds the Twins’ record for career batting average (and is 2nd in this category for the Angels’). What I find amazing about all of these things is that Carew’s career could’ve started 3-4 years earlier if not for a commitment to the Marine Corps and probably would have lasted 2-3 years longer if Major League owners had not conspired to force him into retirement in 1985 (not conspiracy theory – it’s been proven and a judge awarded Carew nearly $800,000 in 1995 as a result) and then his numbers may have just been ridiculous – can you say potential 4,000 hit club member? I gave a lot of thought into who deserved this table but for me, it kept coming back to Rod Carew. 3x NFL Champion, 4x AAFC Champion, 5x Pro Bowl Selection, 9x All-Pro Selection, 1x Second Team All-Pro Selection, NFL 75th Anniversary Team, NFL 1950’s All-Decade Team, 3x NFL MVP, 1950 Pro Bowl MVP, 2x AAFC MVP, 1955 Hickok Belt Winner, Hall of Fame – 1965. While there are not many athletes across sports who wore the #60 this was no easy task. It came down to Otto Graham, who some NFL historians consider the greatest quarterback of all time, and Chuck Bednarik, the last true two-way player in the NFL. Both are great but I had to take Otto Graham. In the AAFC and later in the NFL, Otto Graham took the Browns to the title game in 10 straight seasons, he won 7 of those. He won every championship in the brief history of the AAFC and then when the Browns joined the NFL, they won it all in the very first season. His 86.6 QB Rating is among the best all-time. He finished his career (when football was a running game) with 23, 584 yards passing and 174 passing touchdowns. His 57-13-1 record as an NFL starter over 6 NFL seasons represents the highest winning percentage (.810) of any quarterback in NFL history. In addition to his Hall of Fame football career, he also briefly played for the Rochester Royals in the National Basketball League and helped them win the 1946 Championship. There’s not a doubt in my mind that Graham was the best athlete to ever don #60. ON THE WAITING LIST: Bill Willis, Walt Kirk, Scott Schoneweis, & Jose Theodore. Like #60, not a whole lot of athletes have worn #79 but it has been worn by some great NFL players. While Bob St. Claire and Roosevelt Brown deserve some consideration – I had to go with Harvey Martin who was perhaps, the best pass rusher of the 1970s. He was a very large factor in the first Super Bowl Win in Dallas Cowboys history which led to him being the co-MVP of that Super Bowl. As the cornerstone of the vaunted Doomsday Defense he had 114 sacks in his 11 season career. He led the Cowboys in sacks in 7 of those seasons. Table #79 has to go to Harvey Martin in my eyes. Click to enlarge the seating chart for Sports Heaven’s most exclusive restaurant. In a great battle between Iron Men (Favre and Gehrig) and one of the greatest hockey players of all time (Orr), I had to take Lou Gehrig. For the longest time I thought I would take Brett Favre, one of the greatest Quarterbacks of all time, but then I began to realize that Gehrig is probably the greatest first basemen of all time and not just that, I think he is one of the top 5 baseball players of all time. About 10 months ago I wrote that, “If I could build an all-time team around one player – no doubt in my mind that that player would be the Iron Horse” and I don’t plan to detract from that now. He started and played in 2,130 straight games (a record until Cal Ripken, Jr. broke it in 1995), he has 23 career grand slams, scored the winning run in 8 World Series games, has the most extra base hits of a first baseman, had a .765 slugging percentage in 1927, and was so good that the Hall of Fame waived the waiting period rule so they could vote him in a few months after he retired. Had Gehrig not come down with ALS (Lou Gehrig’s Disease), he would have likely finished his career with around 3,700 hits and 650 homeruns. In my mind, Lou Gehrig, not Babe Ruth, is the greatest Yankee of all-time. More than that, he was a great all around person and his famed “Luckiest Man” speech, in my opinion, is the single most moving moment in the history of sport. There’s a reason that Richard Petty is known simply as “The King”. He is without a doubt one of the greatest NASCAR drivers of all-time and his 7 NASCAR titles are a record (tied with Dale Earnhardt). He is also the only driver to have won the Daytona 500 7 times. His 127 poles and 700 top 10 finishes in 1,185 races are also unbelievable feats. Even sports fans like myself that really do not follow NASCAR are aware of the accomplishments of Richard Petty and have heard of the Richard Petty School of Driving. This was a pretty simple decision for me to give Table #43 to Petty. 58 was one of the easiest decisions I had to make. You could make an argument for Jack Lambert here but Derrick Thomas is one of the greatest pass-rushers of all time. I’m amazed to this day how long it took him to get in the Hall of Fame because the guy was an absolute beast. He hold Chiefs franchise records with 41 career forced fumbles, 8 forced fumbles in a season, 19 fumble recoveries, 126.5 career sacks, 20 sacks in a season, and 3 career safeties. Additionally the guy holds the NFL record for most sacks in a game with 7. That mark broke the previous record of 6 in a game, which had also been set by Thomas. John Elway always said he could’ve played a few more years in a warmer climate like Miami. I think Elway could’ve played a few more years if he didn’t have to face Derrick Thomas twice a year. As a collegiate player, he set an NCAA record with 27 sacks in a single season while at Alabama. His 52 career sacks at Alabama were also an NCAA record at the time. It’s unbelievable to think of what Thomas could’ve accomplished if his career and life had not been cut short due to paralysis. No doubt in my mind that Table #58 belongs to Derrick Thomas. 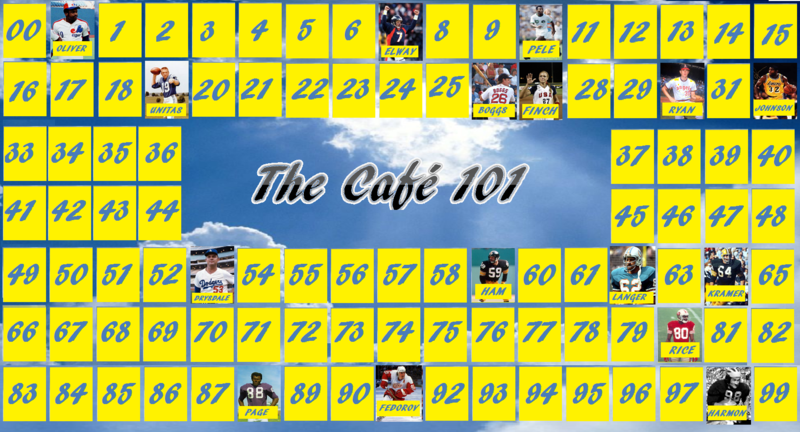 On back to back numbers we have famous Kansas City Chiefs defenders getting themselves a table at thea Cafe 101. 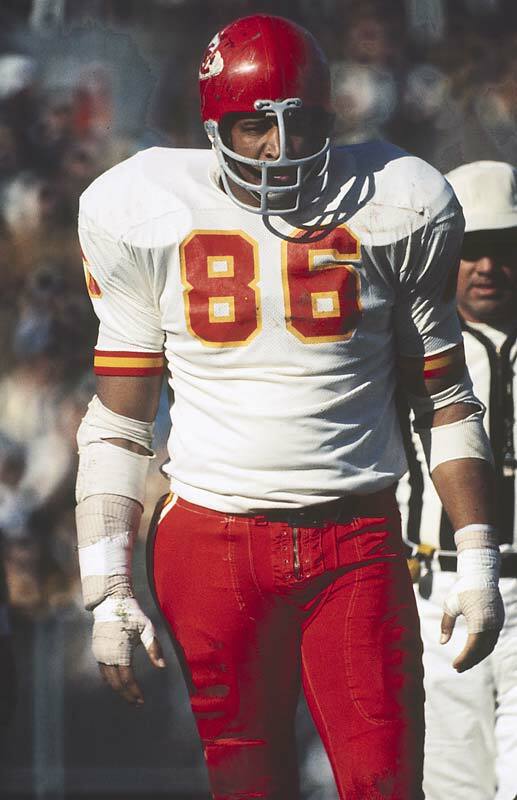 Buck Buchanan was an absolute monster from the time he played at Grambling under the legendary Eddie Robinson to the time he was the first draft pick in AFL history and had an amazing career with the Chiefs. He was also the first black player to be drafted #1 overall in professional football history. His defense and ability to penetrate the Minnesota Vikings’ vaunted offensive line helped the Chiefs hold the Vikings to only 67 yards giving the Chiefs their only Super Bowl win and one of the biggest Super Bowl upsets in history. At 6’7″ 287 lbs, Buchanan was a force to be reckoned with. Despite his size he was very quick and could run a 4.9 40 which allowed him to make tackles from sideline to sideline. He started 166 straight games and is one of the greatest players in the proud history of the Kansas City Chiefs. Click to enlarge the seating chart for Sports Heaven's most exclusive restaurant. 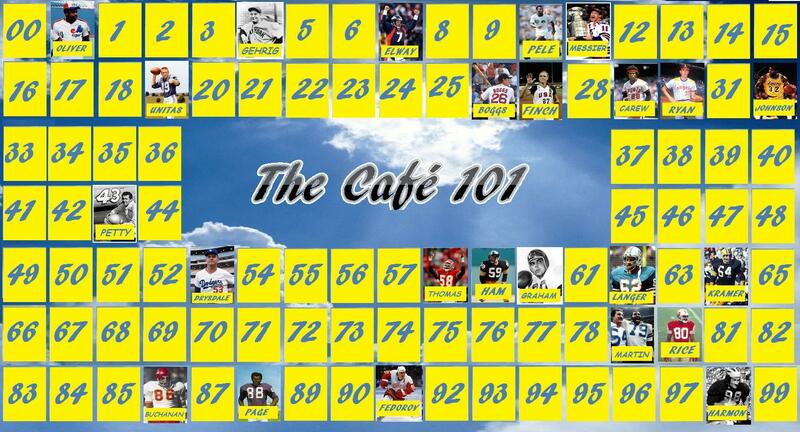 So far 12 tables at the Cafe 101 have been spoken for. 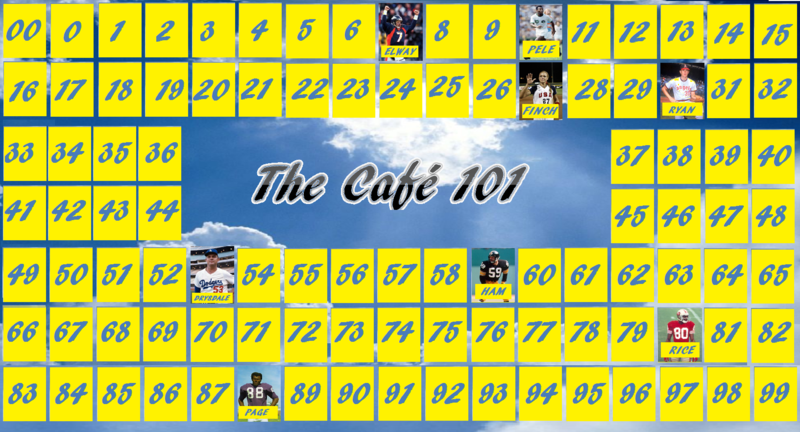 There are some athletes left wondering why they’ll never get into the Cafe 101 while many still remain hopeful that the hostess will call their name and that they will gain entrance to the most exclusive restaurant in Sports Heaven. Today 4 more will get the call as I dive into exploring the greatest athletes to ever wear the numbers 19, 26, 62, & 98. 19 is a number that has been worn by two of the greatest quarterbacks of all time, one of the greatest hockey players of all time, one of the greatest pitchers, one of the greatest outfielders, and one of the all-time greatest shortstops, among several other athletes. This was definitely the toughest decision of this installment because there are easily 5 or 6 players you could argue as the greatest 19 but for me it kept coming back to “The Golden Arm”, Johnny Unitas. There are many who still consider Johnny Unitas the greatest QB to ever play the game. Originally drafted by Pittsburgh in 1956, the Steelers thought he was too dumb to play quarterback and cut him before the season even began. The rest as they say, is history. Johnny Unitas was the 1st Quarterback in NFL history to pass over 40,000 yards and his 10 Pro Bowl selections as a QB were a record until Brett Favre got his 11th in 2009. At the time of his retirement, his 118 regular season wins were an NFL record. Along with Kurt Warner, he is one of only 2 quarterbacks to have attained a QB Rating of 120 in 4 consecutive games. His 3 NFL MVP awards were also a record that was later tied by Brett Favre and broken by Peyton Manning. It is a good thing that Unitas did not live long enough to see Peyton break his record as he severed all ties with the Colts once they left Baltimore and in his final years embraced the Ravens. There is no doubt in my mind that Johnny U is the greatest to ever wear 19. At #26, sit two of the greatest shutdown corners to ever play in the NFL but for me #26 is Wade Boggs. Wade Boggs was one of the greatest MLB players of all time and one of the best to ever play the hot corner. His 12 consecutive appearances in the All-Star as a third baseman is third best all-time behind George Brett and Brooks Robinson. Between 1982 and 1988 he had only one season where he batted below .349 (he batted .325 in 1983) and had 7 consecutive seasons in the 80’s where he collected 200 hits and 100 runs. In his 18 year career he had only 3 sub-.300 batting seasons. In 1996, Wade Boggs helped the Yankees win their first World Series in 18 years. The most noted achievement of Wade Boggs’ is that he was the first player in MLB history whose 3,000th hit was a Home Run. While there are several athletes you can make an argument for – to me Wade Boggs is the most deserving of Table #26. When it came down to #62, I knew I was going with Jim Langer. He is one of the greatest centers of all time. Only one team in NFL history has pulled off the perfect season (the 1972 Dolphins) and the line that led to that success was anchored by Jim Langer. He is remembered primarily as a quick blocker. What made Langer so unusual and so good is that he was a converted middle linebacker. He had the strength and speed of a linebacker combined with the size of lineman which made him an incredibly productive pass protector. Yes, #62 belongs to Langer. There are few college football programs that are more storied than the University of Michigan Wolverines. Many greats such as Desmond Howard, Ron Kramer, and Tom Brady played their ball there but if you ask most Michigan fans the greatest Wolverine of all time they will tell you it was “Old 98”, Tom Harmon – the first Michigan Wolverine to win the Heisman. Tom Harmon was the original dual threat player. He finished his time at Michigan with 2,134 yards rushing, completed 100 passes for 1,304 yards and 16 touchdowns. He led the nation in scoring in 1939 and 1940 (a feat that has never been matched). To understand how good Harmon was, all you need to do is take a look at his last collegiate game which came in Columbus against Ohio State. In that game, he scored 3 rushing touchdowns, 2 passing touchdowns, 4 extra points, intercepted three passes, and punted 3 times with an average of 50 yards per punt. Due to his love of broadcasting, Harmon only spent one season playing professionally and then pursued a career in acting and broadcasting. He could have been just as legendary as a pro as he is as a collegiate athlete. Table 98 has to be given to “Old 98”. In our first course I took on the challenge of seating tables 7, 30, 59, and 88. This week I take on two pretty difficult tasks as I have to take on Table #10, a number that is sacred to soccer and #80, a number donned by some of the greatest wide receivers of all time. 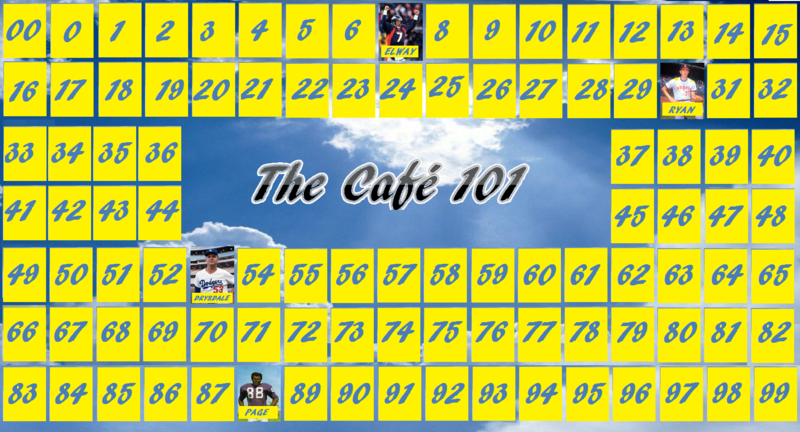 If you would like to read my previous Cafe 101 post please use the link above. 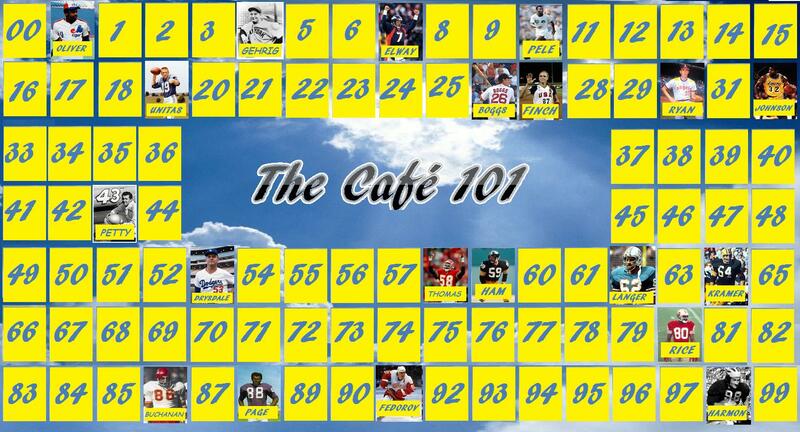 So without further ado, let’s look at four more tables at the Cafe 101. I was told that when I went with #10 I was going to have to choose a soccer player. The #10 is sacred in the sport of soccer but the reason it’s so sacred is the only player to have 3 World Cup medals – Pele. While my favorite #10 is Fran Tarkenton and a lot of great athletes have worn this number, Table #10 is about “Who is the greatest soccer player of all time?” and in my opinion that is Pele. Aside from his championship pedigree, his 1281 goals in 1363 games is still a record for most all-time. In baseball we often talk about the 5-tool baseball player as that rare guy who can do “EVERYTHING”, well Pele was a 5-tool soccer star. He could dribble, he could pass, he could shoot, he could head, and he could score. Not only was he named the soccer player of the century; he was named by the Athlete of the Century by Reuters and the International Olympic Committee. While I thought for awhile about this table, when I think #10 I think Pele and I think most other sports fans do as well. He is so well-respected that multiple countries around the world have depicted him on their postage stamps. I’m no expert on the game of soccer and while some may consider Maradona, Zidane, or one day in the future Lionel Messi – I still believe Pele to be the greatest soccer player of all time. There are many great athletes who have worn the #27. Many immediately think of Carlton Fisk or Juan Marichal in baseball. They think of Scott Niedermayer in hockey and Eddie George or Steve Atwater in football. There are a lot of current stars in sports who don 27 but I feel like the greatest athlete to have worn 27 is Jennie Finch. I understand that my knowledge of the sport of softball is limited and she is from my generation but the more I talk to those who follow the sport, watch highlights, and read, I am convinced that Jennie Finch is the greatest all-around softball player in the history of the game. She’s always been a winner – she won one national championship in college, has two Olympic medals, and won two World Cups. As a college pitcher she set an NCAA record with 60 straight wins shattering the previous mark of 50. Over a four year college career she won 119 games and struck out 1,028 batters including going 32-0 in her junior year. She had a 1.07 career ERA in college, and a 0.42 career ERA as a member of the USA National Team. Her pitch was 71 mph (the equivalent of a 98 mph pitch in baseball) and she threw it consistently. While I could not find an exact number of no-hitters and perfect games she pitched, I do still remember when she threw back-to-back-to-back no-hitters in the 2000 College World Series. On top of her pitching prowess she was also great hitter, batting over .300 each year of college and for the Chicago Bandits in 2005. She even put together a 14-game hitting streak her sophomore year of college. Yes, I feel pretty confident that Jennie deserves Table #27. I’ve had a number of my readers ask how I decide what four numbers I am going to do for each article. It’s simple really, I use a Random Number Generator to select one number between 00 and 23, 24 and 48, 49 and 74, and 75 and 99. When I was given these four numbers I didn’t realize that #59 would be so tough. I immediately thought of Jack Ham but then I was reminded of London Fletcher – a largely underrated linebacker who has better stats than the much-heralded Ray Lewis with more Super Bowl appearances meanwhile collecting more tackles than any other player between 2000 and 2009. But when I compared the two, I had to go with Jack Ham who is considered by many to be the greatest outside linebacker the NFL has ever seen. During his career, Ham had 25 career sacks (unofficially), 32 interceptions, and 21 fumble recoveries. He was a leader of the famed “Steel Curtain” defense and was known for his speed and ferocious tackling ability. What he’s most remembered for though is being a highly intelligent football player who rarely missed an assignment or was out of place. Many players in his time often noted how “you couldn’t trick Jack [Ham]”. 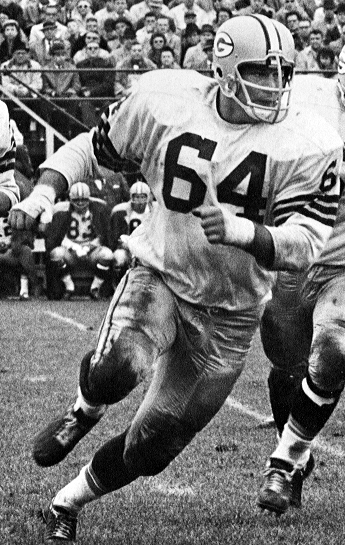 He is one of the greatest defensive players the NFL has ever seen and deserves Table #59. There have been a number of great athletes who have worn #80 but this was without a doubt going to Jerry Rice, not only the greatest wide receiver of all-time but to many – he’s the greatest football player of all time. He holds the record for career receptions with 1,549 (445 ahead of Tony Gonzalez), as well as receiving yards with 22,895 and total non-passing touchdowns with 208. From 1985 – 1999 he had 1000 yards receiving each season and holds nearly every receiving record of significance. Jerry Rice is such an obvious choice for this number that there really isn’t much to say here. Imagine this sports paradise and the Cafe 101 is the most exclusive of restaurants in sports heaven. There are only 101 tables with each numbered table being given to the greatest athlete to don that number. Who would get the table, who would just miss out? Who would at least be worthy of placing on a waiting list? It’s time to introduce the first four members of the athletic afterlife’s most exclusive club. Without a doubt, the number 7 is one of the most sacred jersey numbers in all of sports. To those who love baseball it’s Mickey Mantle, to soccer lovers it’s David Beckham, and for basketball fans it stirs up images of “Pistol Pete” Maravich. 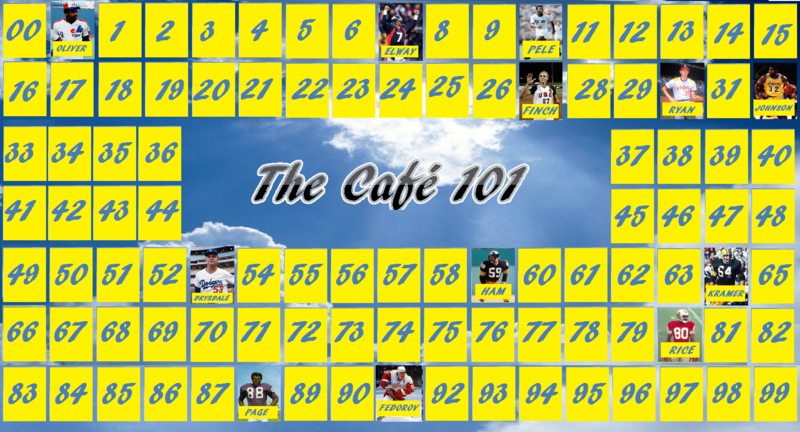 Without a doubt, Table # 7 is one of the most exclusive tables at the Cafe 101 because so many great athletes have worn the number but when push came to shove, I had to choose John Elway. Table #30 was another tough one but for me it came down to 2 defenders who were leaps and bounds ahead of the competition. There are many who are going to be disappointed that I selected Nolan Ryan over perhaps the greatest goaltender of all time in Martin Brodeur but there is no denying Ryan’s dominance as a pitcher. His 5,714 strikeouts are the most all-time and I believe that no one will ever approach his mark of 7 no-hitters. On top of that he had 12 more games that were one-hitters. Of course on the flip side, Ryan is the only pitcher in MLB history to have walked 200 batters in a season twice. However I think with Ryan, the good outweighs the bad. What I most respect about Ryan is that he excelled as a pitcher over such a long period of time having played in the Majors in 4 different decades. He is so respected that he is the only player in the MLB to have his number retired by three different teams. As we get into larger numbers, the pickings get a bit more slim as many sports rarely have numbers past 40. While the pickings are a bit more slim than 7 and 30 were, there were still some very great athletes the donned jersey number 53. The best athlete to ever wear the number was Don Drysdale who, along with Sandy Koufax, formed the most dominant pitching duo in MLB history. Don Drysdale was overlooked throughout much of his career because he always pitched in Koufax’s shadow but he was a legend in his own right. In his Cy Young season in 1962, he won 25 games. In 1968, he set an MLB record with six consecutive shutouts and 58 consecutive shutout innings (since broken by Orel Hershiser). Drysdale is also one of the better batting pitchers of all time. In 1965 he batted .300 with 7 home runs. He finished his career with over 2,400 strikeouts, 209 wins, 167 complete games, and 49 career shutouts. What is unbelievable is that he was forced into retirement by a sore shoulder, it’s crazy to think about what he could’ve accomplished with 5 or 6 more seasons in the league. I thought I had this great #88 debate solved when I finally decided to take Alan Page over Michael Irvin but then I was reminded that Tony Gonzalez, the greatest Tight End to ever play the game and 2nd most prolific receiver of all time, is also #88. After much consideration I still had to give the edge to Alan Page who was the cornerstone of the greatest defensive line in NFL History – the Purple People Eaters. He may just be the greatest defensive tackle to ever play the game. He played in 218 consecutive games in which he recovered 22 fumbles and collected an unofficial 148.5 sacks . His three safeties are the second-most of all time. Additionally in 1971, he became the first defensive player to be named the NFL MVP. Page was such a great athlete that he was the first active NFL player to complete a marathon. While I mean no disrespect to other great athletes who wore the number 88, I believe this table belongs to Alan Page. But seriously, if someone wanted to challenge Alan Page for this table – could they really take it from him?